We are Looking for Forever Homes. Deworming, microchipping, neutering/spaying, and vaccination will be done prior to adoption. Hi, my name is “Grumpy”. I don’t know how I got that name because I’m not a grumpy cat. I’m actually a happy cat and always smiling and purring. I used to be a semi-feral kitten but I was trapped a couple of months ago along with 2 other siblings…..Yes, I wasn’t happy because I didn’t have a human contact before and my foster mom had kept petting me like crazy but I didn’t feel bad…it was kinda good. I learned that human contact wasn’t that bad after all. I currently living with dogs and cats. I get along with all of them and never fought against anybody. 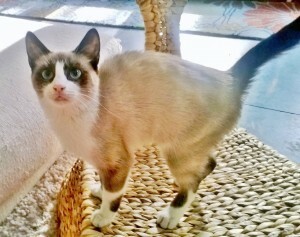 Since I’m good with human and other animals, my foster mom told me that it’s a time for me to leave the nest, so I’m looking for a new home meow. I prefer quiet home with no small children under 7 because I’m still sensitive to big noises and a human’s quick movement. If you have another cat in the house or can adopt me with another cat, that would be purrfect. If you are interested in seeing me, please fill out an adoption application form.